With the Norman Conquest more written records become available and reliance on archaeological evidence becomes less important. Prior to the Conquest Wymeswold was divided between two manors held by two brothers. Later one took over the other's part to make one manor. The Domesday Book shows that in 1086 Wymeswold was divided into four parts. The chief landowner was Hugh de Grantemesnil, the others being Durant Malet, and Roger de Busli, while the land of King's servants was held by Robert de Jorz. Much of Wymeswold was then under the plough. There were 55 acres of meadow. No woodland was mentioned. People employed in the village included Frenchmen and a slave. Subsequently, these lands had various owners until, in the time Edward III, Richard de Willoughby, who owned one of the three manors, was granted a charter to hold a weekly market on Wednesdays and annual fair on eve and day the apostles of SS Peter and Paul (28th and 29th June). 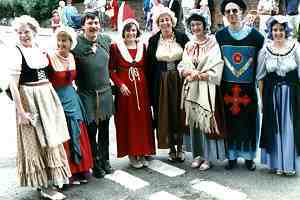 In 1987 the village celebrated the 650th anniversary of the granting of this charter. Part of the Wymeswold charter of 1337. Celebrating the 650th anniversary of the charter. At some time, quite feasibly at the same time as a charter, Wymeswold acquired a market cross. This stood in the middle of the main road at the north end of Clay Street, still known to older inhabitants has Cross Hill (which is why a modern in-fill development is known as Cross Hill Close). The cross stood until 1779 acording to T.R. Potter.